Conrad Farms had its start in 1931. Chester and Pauline Conrad bought their first 80 acres in Timberhill, Oklahoma that year. However, they could not grow enough produce, there. It was necessary for Chester to drive to Bixby to buy produce to peddle. In 1936, Chester came to Bixby to work through the winter. Pauline stayed behind. She picked through finished fields for overlooked produce. She washed and peddled her findings while taking care of two young sons. When Chester returned, they rented another 80 acres. The Conrad family moved to Bixby to farm in 1939. Chester built a large glass greenhouse for growing lettuce plants. In 1942, Conrad bought the land at the current location of Conrad Farms from Holt Malcolm. During the early 1940s, Chester took the produce to the Farmers’ Market in Tulsa to sell. He soon began to sell to chain companies including Safeway, Schuller Fruit, Nash Finch and Tulsa Fruit. In the early 1950s, he started shipping corn to surrounding towns. Soon he was shipping corn to Long Island New York, Des Moines, Iowa, Cincinnati, Ohio, Sioux Falls, South Dakota and Salt Lake City, Utah. In addition, the Conrad family shipped cabbage, cucumbers, radishes, spinach, watermelons and other seasonal products. While corn was loaded onto trucks, local residents drove by asking for corn. A local market was started under a shade tree to meet their needs. As business grew, the family moved sales into a red barn, set up tables and displays. The family played a big part in the growth of the company. They planted, harvested, merchandised and marketed their products to serve the customers. In 1974, another barn was added to Conrad Farms and the operation continued to grow. They opened their business year-round to serve customers. By 1980 they were farming over 1,300 acres, shipping semi-truck loads of produce all over the nation. Parts of Canada were added as customers. However, Conrad’s wholesale profits fell due to changes in the economy in 1986. They scaled back their wholesale endeavors and focused on the local market. Every summer, Conrad Farms sell over half a million ears of corn and roughly 15,000 watermelons. They grow about seventy varieties of produce. Conrad Farms corn is world famous and highly anticipated each year. The family market offers unique specialty items and dairy products. 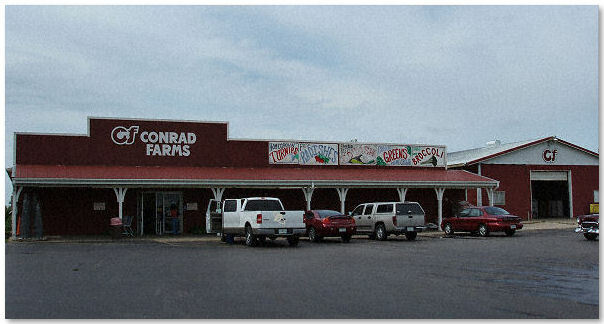 Conrad Farms is not only a staple in Bixby, it is a tradition. It continues to flourish, with years ahead and many, many more ears of corn.